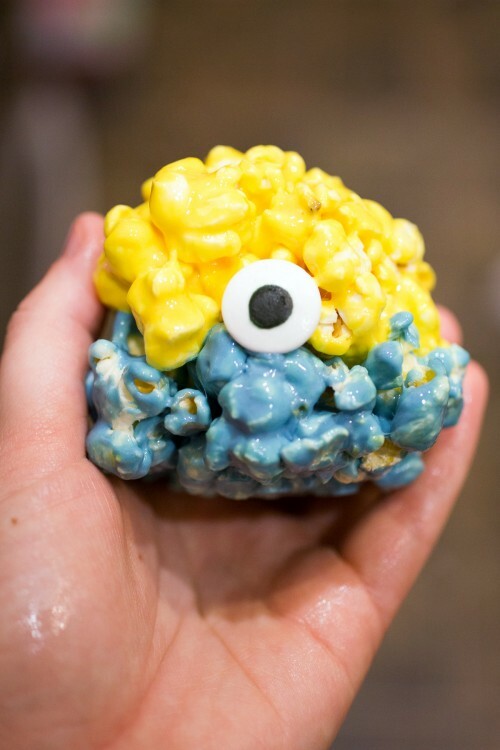 We made some Minions Popcorn Balls for a Minions Movie Night celebration to watch the new DVD. 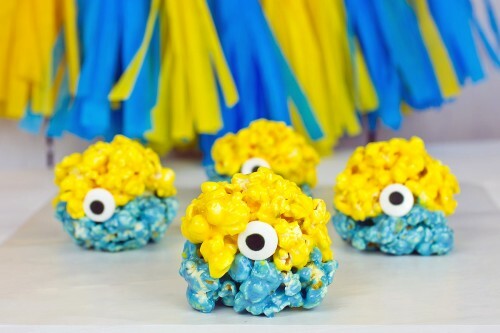 My son was so excited to enjoy these adorable minions treats! My son has been asking constantly when a certain movie would be released. Which one? Minions © 2015 Universal Studios. All rights reserved. So, of course, we headed to Target when it was released to pick up a copy of the Blu-Ray/DVD combo pack. The DVD includes 40 minutes of Target exclusive content. We chose the Minions Metalpak Blu-ray/DVD Deluxe because I just love how cute Stuart looks on the Target exclusive collectible tin. 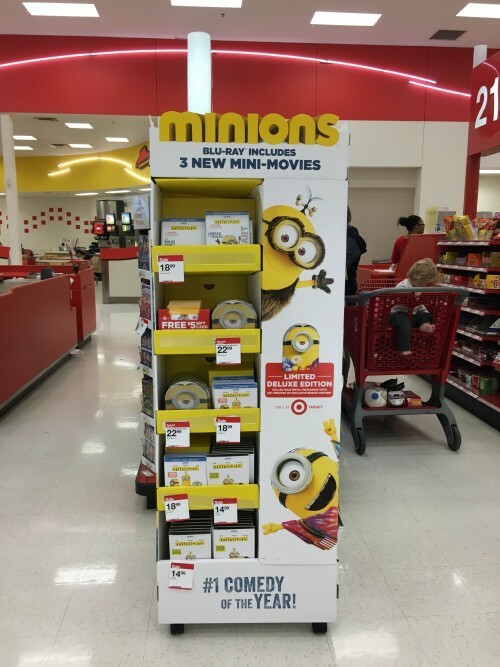 Target is the perfect one stop shop for all your movie night needs — including popcorn for your Minion Popcorn Balls! Prepare a bag of the Market Pantry popcorn according to package directions. Meanwhile, melt 1/8 cup of butter in a medium saucepan. 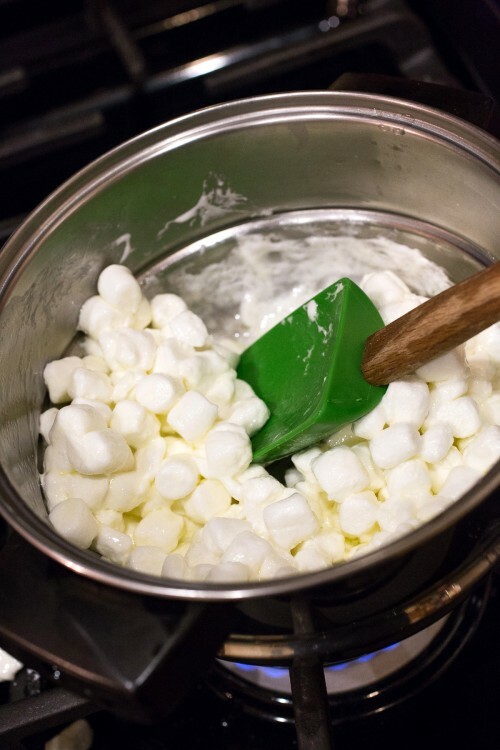 Add half of the bag of marshmallows, stirring constantly until they are completely melted. 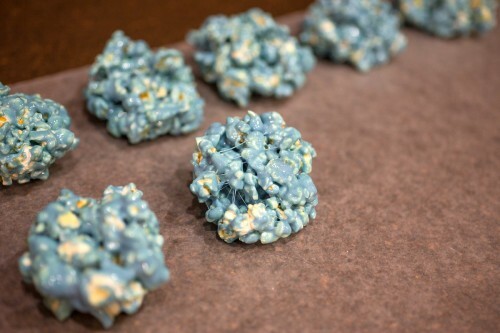 Add several drops of blue food coloring and mix well. Place half of the popcorn in a large bowl and pour in the marshmallow mixture. 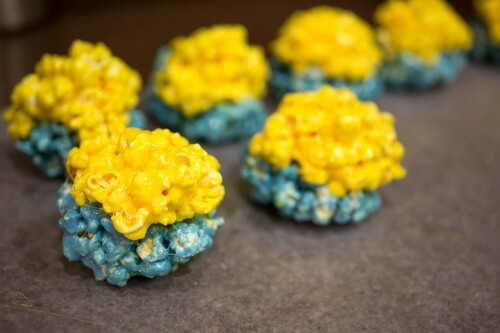 Stir to coat the popcorn with the marshmallow mixture — your popcorn should be blue. Lay out a sheet of wax paper, and spray your hands with the nonstick cooking spray. Grab a small amount of the popcorn mixture and form the bottom half of a circle. Set on the paper and repeat with the remaining blue popcorn. Melt the remaining butter and marshmallows, this time adding yellow food coloring. Stir into the remaining popcorn to coat. 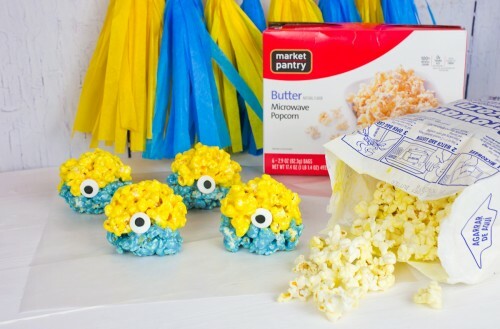 Spray your hands again with cooking spray and shape the popcorn into the tops of the popcorn balls. Shape the entire ball into a circle to create your minions. 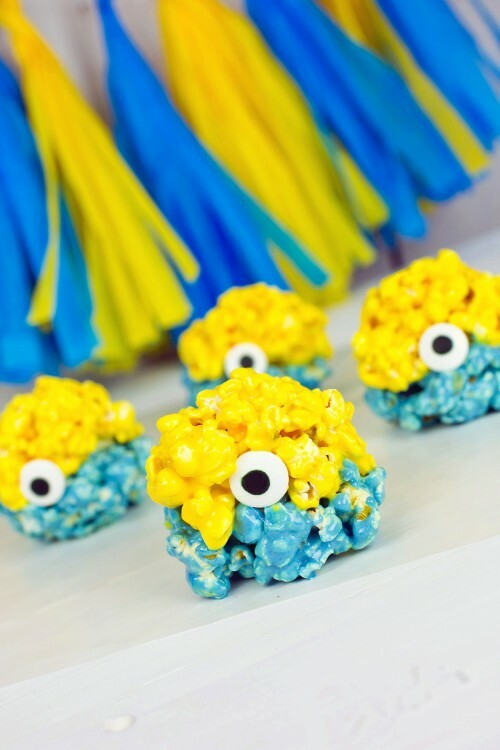 Press candy eyes to the front of each popcorn ball and set aside to allow the popcorn balls to harden. When I showed these to my son, he called them little “Stuarts.” I think that Stuart may just be his favorite minion. It’s awesome how Illumination Entertainment was able to give each of the little guys their own personality. They look so much alike, but you can still tell them apart. 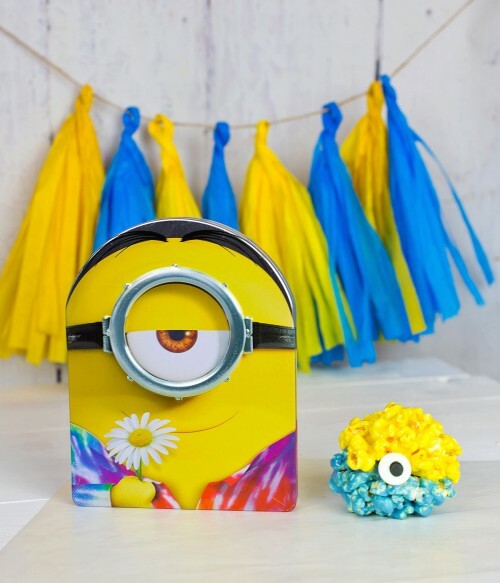 Ready to have a Minions movie night of your own? 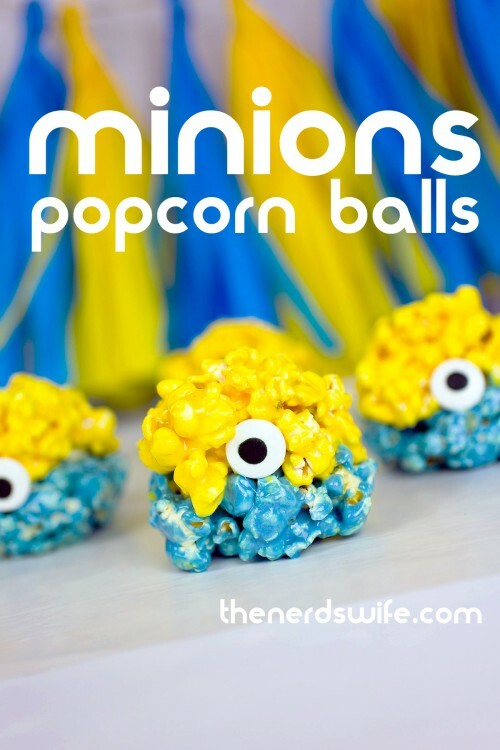 Check out these other creative ideas!